Oh, my days. Nagasawa starting up front ahead of Nagai, Johnsen, Omae, Hara? WHAT??? Nishibe holding his place in goal over Kaito? WHAT??? And, lo. He gets beaten by two speculative long range efforts to put the icing on the cake. The cake had up till then been comprised of some really nice passing play and positive forward movement from ourselves, but why we had Nagasawa partnering Okazaki I will never know. He was subbed off just after the hour for Johnsen, by which point most the game was already played and Yokohama were getting their claws in. So glad we're still in the cup, but for the love of all things holy Kenta, please stop making knee-jerk selection changes. Johnsen being injured for a week should not then mean his place is therefore lost to 21 year old rookie. Sorry, I can't type any more. Too angry / bemused / disappointed. We lost and we fully deserved to. How long ago our top-of-the-table exploits seem now! Down to sixth, but incredibly we've still lost only the joint least in the league. 3rd is now impossible, 4th is going to be a mission, but we're in the quarter final of the cup which is more than can be said for most other teams, so at least we have that. Kenta was forced into replacing Johnsen who picked up a knock in training, but the dropping of Kaito in goal for Nishibe had me scratching my head before kick off. 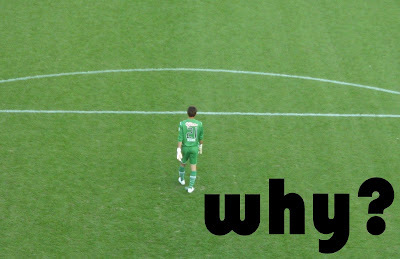 One dodgy game against Reysol and the keeper is dropped. This is after an excellent season which resulted in a national team call up recently. A keeper's confidence is paramount, so why knock Kaito's even further? He's clearly the best keeper we have. Nishibe didn't have a terrible game, but he was all over the place on the second goal. To get beaten to a cross by an attacker is poor. Well, the season nears an end, and the best we can hope for is fourth. Again. I think without any silverware between now and the end of next year Kenta Hasegawa will be looking for another team. I dearly hope he proves us wrong, because I like him, I really do. But football is about winning things, and we've been coming up short time and again the last four years. There were a couple of crazy results this weekend which make our recent rubbish form not quite so hard to take. Kawasaki losing to bottom of the table Oita (ex-Pulser Fernandinho netting the only goal) and FC Tokyo losing to already-relegated JEF both go to show that we're not totally unique in our ability to pull shockers like the ones against Oita and Reysol. Awesome home support as usual. Saturday's crucial match with Gamba Osaka has officially sold out. The announcement came early this morning, making it one of the fastest selling games in recent memory. It is also our second home league game in a row to sell out, underlining our excellent season at the turnstiles. With just one further home game remaining we are looking set to record an average gate well up on last season, and our highest since 1995 when the J. League boom was at it's peak. Our final league match of the season with Nagoya on December 5th is also selling fast. As of two days ago, only 3000 tickets remain, with S, SS, and A Zone all sold out. If you're thinking of going, act now! In other news, Okazaki was among the scorers last night as Japan beat Hong Kong 4-0 in a qualifier for the 2011 Asian Cup. Okazaki is currently four goals off the pace in the hunt for the J. League Golden Boot, but continues to bang them in for the national team. He should have done enough this year to secure his place in South Africa next year where I'm sure he'll shine. Emp. 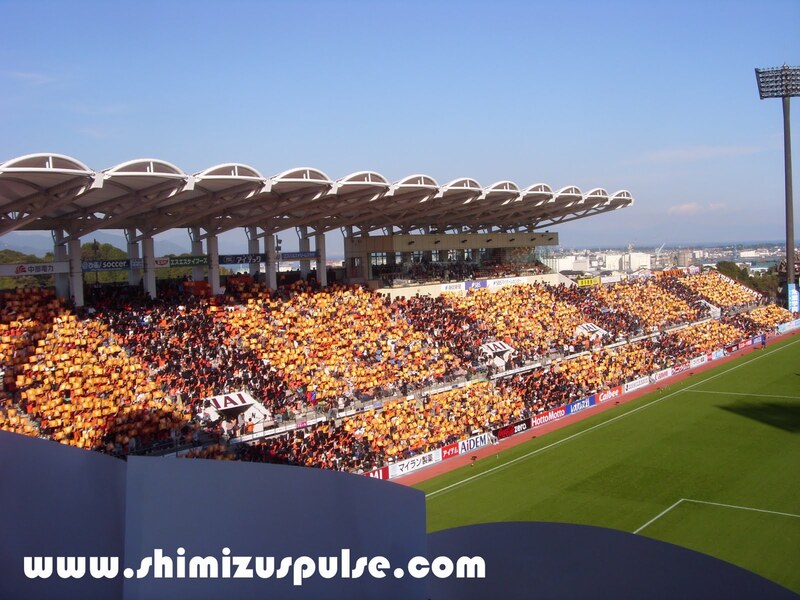 Cup 1/4 Final Venue Confirmed: Nihondaira! Seems we've lucked out big style. The Emperor's Cup quarter and semi final venues and kick off times were announced today, and we've been handed a home draw in both, should we progress. The quarter final tie with Alibirex Niigata will be played at Nihondaira, kick off 1pm on Saturday December 12th. If we win we'll go on to face the winner of Nagoya and FC Gifu which will be played Tuesday December 29th at Ecopa. Kick off 1pm. Click here for the official announcement (Japanese). This reporter thinks we've been handed a massive chance to make our first Emp Cup final since 2005, and will be gutted if we don't make it. Come on, boys! Ladies and gentlemen, may I introduce to you the newest member to join the S-Pulse orange army, Aisha Ozawa! Expect to see her down Nihondaira with her Mum and Dad as soon as she's big enough. 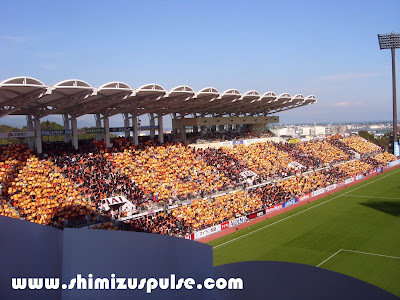 In unrelated news, the match with Gamba Osaka this Saturday will be the setting for the most recent of our semi-regular stadium-wide choreographed supporter displays. If you're yet to get your ticket, you'd best get one right away as at last count there just a handful left! A much needed win for the boys in orange takes us through to the quarter final of 2009's Emperor's Cup. Both teams had very much their second strings out. As for us, we gave a first start of the season for lanky front man Shun Nagasawa and first-starts-in-a-while for Paulo and Hara. Despite (or, going on recent results, perhaps because of) the rests given to regulars Kaito, Hyodo, Teru, Edamura, Okazaki and Johnsen, we didn't show too many problems in dispatching J2's high flying Ventforet Kofu. Kofu are currently battling it out with Hidetoshi Nakata's old team Shonan Bellmare for the final promotion spot to J1, so probably have their minds elsewhere. I didn't get to see the game, so can't offer anything other than the bare bones of what happened, but the result will be an invaluable boost after the Kashiwa Comedy Show. Goals for Nagasawa and Hara will remind our regular forwards what it is they've got to do these last three league games if we're to claim an ACL spot. In our three Emp. Cup games, we have a combined score of 7-0, with goals coming from Hara, Paulo, Nagai and Nagasawa. We progress to the quarter finals for the 12th time in our 18 appearance in the tournament, and the fifth season running. We've made the final twice, in 2001 and 2005, winning the trophy once, in 2001. Before we can start thinking of this year's final we have to meet either Albirex Niigata or Meiji University who will face off tomorrow in Yamagata. Meiji Univesity in the last sixteen of this cup is the Japan equivalent of the non-league giant killer. They knocked out J1 Montedio Yamagata last round, so good luck to them tomorrow. The quarter final with Niigata or Meiji Uni will be played Saturday December 12th, venue and kick off time to be confirmed. A stunning travelling support made it's way over 100 miles north of a Sunday evening only to presented with a shocker of a performance. Even after the final whistle they sang on. But that horrific night is now dead and gone. Not forgotten, but for the time being there are bigger things to worry about. Starting with progressing in the Emperor's Cup on Saturday, then the make or break tie with Gamba Osaka next Saturday (21st). 0-5, but we won't quit. I have absolutely nothing to say about this joke of a performance. I'm certainly not going to spend my time writing a report or team listings etc etc. If the team can't arsed, then neither can I.